How do you celebrate your dad? Do you cook for him or take him out to a nice meal? Do you fire up the grill for him? Sometimes it’s hard to find something perfect for the grilling dad because it seems like he has everything! However, he probably does not get to enjoy a Cowboy Cut Ribeye from Snake River Farms and Double R Ranch everyday. With help from my friends at Snake River Farms, you have a chance to WIN some great steaks for dad. Now that’s a Father’s Day deal you cannot pass up! Double R Ranch Cowboy Chop is USDA Prime Grade, so it’s highly marbled, juicy and delicious. Only 4% of all beef in the U.S. is Prime. Get the bone-in for more flavor and eye-opening presentation. This cut is 2+ pounds so it serves at least 2 people. We like to think of it as a huge steak or small prime rib. Seriously, you cannot go wrong! One thing my dad loves more than anything is a perfectly grilled steak. He loves the flavor and he can grill one of the meanest cowboy steaks I have ever had! My dad is a great griller and someone who taught me at age five that true Grill Masters always own a Weber! My Father’s Day will be spent with my dad in our backyard, full of family, and of course all our grills will be fired up! I will be lighting up a Weber charcoal grill, seasoning these awesome steaks, and grilling the best steak for the absolute best dad! So, take time out this year for your dad, get your Weber grills fired up, and celebrate him the best way we know how! 1. Take the steaks out of the freezer in the morning and place them in the fridge. They should defrost by the time you need to put them on the grill (6-8 hours). When they have defrosted, or if they are fresh, take them out of the refrigerator 30 minutes to 60 minutes before you place them on the grill. Note: The reason we do this is because of the thickness of the steak. Searing at the beginning will cause the muscle fibers of the meat to contract, pushing out moisture, which is not what we want to do. When we grill the steaks indirectly first, it keeps the meat relaxed, full of flavor, and moist. 4. Plan on grilling the steaks for 17-20 minutes on each side. When you flip the first time, use your meat thermometer to check the temperature. You should be around 80-85 degrees. If it's higher, decrease the amount of cook time on the second side to 10-15 minutes. Tip for grilling with charcoal: I have found that closing the damper on the lid when I move the steaks over direct heat works well. I usually sear for about 2 minutes per side. This helps keep flare-ups to a minimum and gives you maximum flavor and most important, the best steak ever! 5. Once the internal temperature of the meat is about 125-130 degrees, move them over direct heat on the grill for 1.5-2 minutes per side to searing. 6. Take your steaks off the grill and let them rest for 20-30% of the cook time. We are so lucky this year to be able to provide two great grilling dads out there the chance to win some of these delicious steaks! Snake River Farms is giving away two beautiful prize packs valued at $249, and trust me, these are some of the best steaks you will ever have! We all know Father’s Day is about dad, family, and some amazing grilled food. You have two ways to enter. 1. 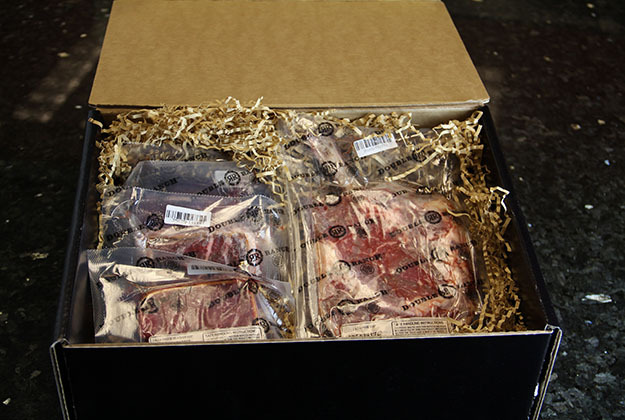 Comment below and tell us why you want to win this awesome steak pack. 2. Head on over to www.facebook.com/kevinsbackyard and comment on the June 11 post about this giveaway. Comment between now and 7:59am CT on Friday, June 12th. GOOD LUCK! Terms and conditions. This sweepstakes is now closed. For more information on Snake River Farms and Double R Ranch check out: https://www.snakeriverfarms.com/fathers-day.html and do something special for dad and treat him to some of the best beef in the USA. Gift packages start at $79. Congratulations to our lucky winner! Kyle H.: These look amazing, I'd love to be able to bring my father and father in law over for a father's day grill out and get both of our families together to celebrate the awesome role models that they are for me but also my son as well. No better way for families to bond than over a great home cooked meal. And no better way for father's to bond than over the grill!